I pre-ordered Eat and Run several months ago on Amazon and have been impatiently anxiously awaiting it's arrival. It arrived last Friday and I read it in 3 days because it's that good. 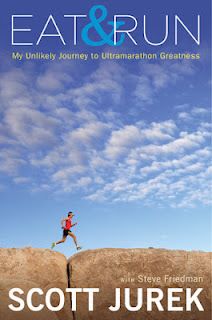 All the things that I am obsessed with such as ultrarunning, trail running, vegan/vegetarianism and the effect of diet on the body...it's all there in this book. He includes his favorite recipes too, scattered throughout the book. 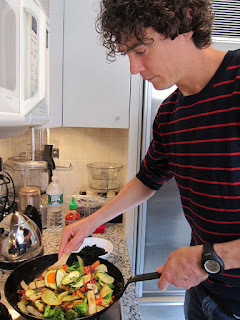 I love his approach to fueling which is pretty simple: REAL FOOD. He eats homemade bean burritos during races and starts every day with a nutritious smoothie. 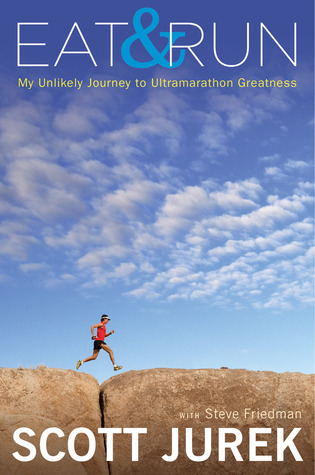 If you are on the fence about ordering the book I would say that you can't go wrong reading it if you're into running and want some inspiration. 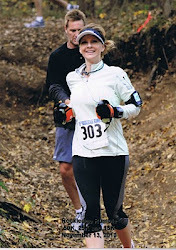 It actually inspired me on two fronts-- with running and with how important a healthy diet is. Thanks for the review! I'll look forward to reading it. I may not be remembering this correctly, but I think he said in Trail Runner magazine (July issue) that he spends on food 3 times what he spends on housing. I assume that's because he eats more calories than the average recreational runner or couch potato, and that he buys organic food. Does he talk about food budget in the book? Hi Paul! His first wife was vegetarian when he met her and into organic whole foods and he said he gave her a hard time and got mad at how much she spent on organic food. Then when he made the switch and started on a vegan diet he said his thinking changed and he chose to think of food as fuel and medical insurance and didn't mind the cost nearly as much as he used to. I can't remember exactly what the comparison was, but do remember he said that he paid something like that...2 or 3 times his rent on food. But i think that was for him and his wife. And I think they lived very frugally as far as rent, lifestyle etc. Great book and definitely worth reading! Just got mine. Will start it this weekend. Let me know what you think! :) See ya at Angel Fire! I inhaled it as well, while at work. Well written by a guy I like a whole bunch. I've been recommending it to everyone. Loved it! Sounds like a great, down to earth guy.